It’s not uncommon to hear people say they feel sick to their stomachs or have butterflies in their stomachs. Often stomach distress or a level of nausea are associated with feelings of stress and anxiety. Beyond being familiar sayings, is there a connection between gut health and your emotions? Let’s consider the latest research and basic facts about your gut. Recent research identified that gut microbiota ( the organisms such as “good bacteria” residing in your intestinal tract ) interact with the regions of your brain which are linked to behavior and mood. Referred to as the Gut-Brain Axis, these brain-gut-microbiota interactions could play a key role in human behavior and overall well-being. While this connection has been made in rodent and human studies, researchers are still trying to determine if gut bacteria influence brain development and its response to emotional activity. They are also trying to determine if types of grain in the diet influence bacteria in the gut. Either way, this critical research can lead to changes in how we think about human emotions such as anxiety. Also, this research suggests that how we respond to daily stress may also have a connection to diet and to the Gut-Brain Axis (how your gut and brain interact). The statement, “You are what you eat,” is another common adage most people have heard. Research has shown that healthy, fresh foods provide essential nutrients to energize our bodies and minds. Think about it! Have you considered how “junk” food ultimately makes you feel like its nickname. After unhealthy snacks, people often have an upset gut and feel tired, bloated, and weighed down. Nutritious foods and exercise boost your physical health. And these foods and activities have been shown to improve your emotions and mental health, as well as support your immune system. As a fetus develops, two nervous systems form from the same tissue. One is the well-known central nervous system which includes the brain and spinal cord. And the other is the intrinsic nervous system, which is your gastrointestinal tract. Also, during fetal development, the two are connected through the vagus nerve, which runs from the brain stem to the abdomen. And this is how gut bacteria sends messages to the brain. So the gut has more control of your body and emotions than you might think! You may not have realized that as a result of this development, you have neurons in your gut as well as in your brain. And some of these neurons are fired by neurotransmitters produced by gut flora in the gut. One of them is serotonin, a source of feelings of happiness. So guess what? The largest amount of serotonin can actually be found in the gut and not in the brain. 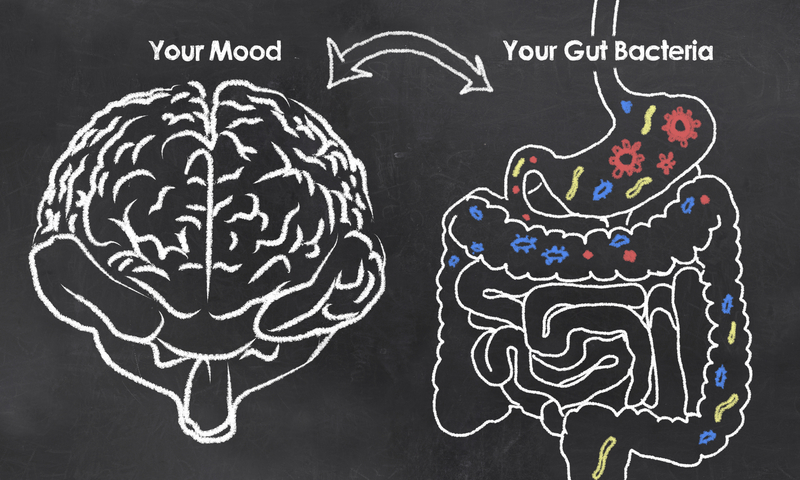 When you consider the connection between the gut and brain, it is easy to understand the gut’s role in your emotions and health. Science has already linked poor gut health to health conditions such as anxiety, depression, chronic fatigue syndrome, obsessive-compulsive disorder, and others. In addition, proper nutrition and taking quality probiotics can help improve gut health and your emotional state. And, the reduction of stress can minimize the overgrowth of “bad” bacteria in your gut. Ultimately, your gut and emotions are linked. When you feel stress, your gut may respond negatively. And, an imbalance between “good” and “bad” bacteria in your gut can lead to emotional issues and conditions. Work with a functional medicine profession to learn more about this connection. Finally, discover lifestyle habits that make a difference in the state of your body and emotions. Consult with a functional medicine doctor to find out more.